U.S. Ambassador Cameron R. Hume (center) feeds the sharks at Sea World Indonesia, as part of the U.S. Embassy’s Earth Day “Under the Sea” celebration. I couldn't find a video of this tank dive, but the press release dated April 18 finally got posted online and the photos of the event finally got posted in its Facebook page. 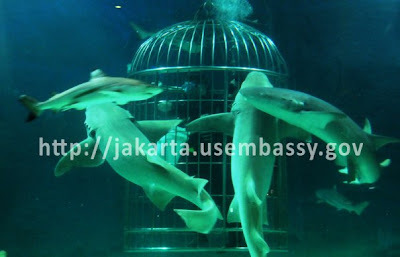 Yep, that's Ambassador Hume inside the cage, behind the label that says http://jakarta.usembassy.gov. Nice, huh? OK, what's this thing with photos? I'm still scratching my head here. US Embassy Kabul labels its photos "all rights reserved" and US Embassy Jakarta tweaks official photos with its URL right smack on the middle. Have you ever seen any of the large formatted DOD photos labeled with copyright notices or its URL? Um... nope, really -- you can check it out here. To the web folks running our digital diplomacy efforts -- please check out the official guidance on copyright protection and US Government work. Works by the U. S. government are not/not eligible for U. S. copyright protection. You can check with our friendly US Copyright Office here. They are pretty good with responding via email. A work of the United States government, as defined by United States copyright law, is "a work prepared by an officer or employee of the U.S. government as part of that person's official duties." The term only applies to the work of the federal government, not state or local governments. In general, under section 105 of the Copyright Act, such works are not entitled to domestic copyright protection under U.S. law, sometimes referred to as "noncopyright." As an exception to section 105, 15 U.S.C. § 290e authorizes U.S. Secretary of Commerce to secure copyright for works produced by the Department of Commerce under the Standard Reference Data Act.